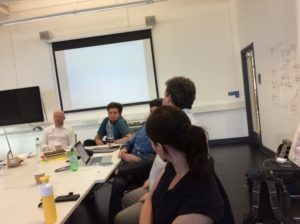 The New Platforms project met for its final workshop on 25th June. 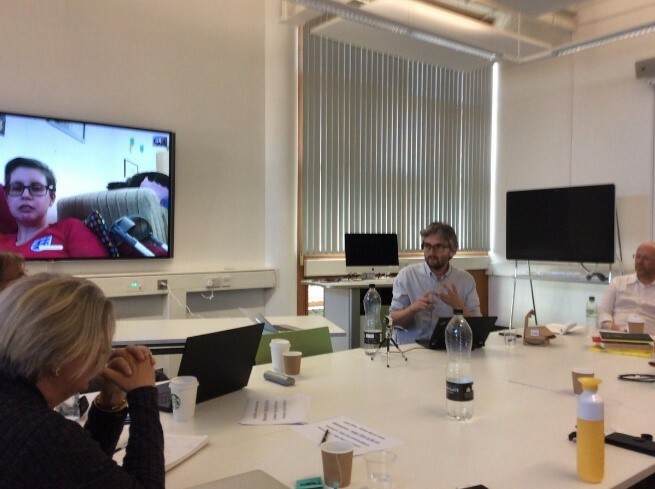 The workshop was hosted by the Centre for Post-Digital Cultures at Coventry University. Present were representatives from most of the presses on the project, including Joe Deville and Julien McHardy (Mattering Press), Andreas Kirchner (Meson Press), Rupert Gatti and Alessandra Tosi (Open Book Publishers), Janneke Adema and Gary Hall (Open Humanities Press / Centre for Post-Digital Cultures), Eileen Joy and Vincent van Gerven Oei (Punctum Books), as well as Martin Keegan, the project developer (who also works for Open Book Publishers), and Penny Andrews, our project consultant. The aim of the day was to assess the progress of the various project work packages and to plan next steps. Here follows a brief summary of our discussions. The streamlining of metadata workflow. The easy exporting of metadata for various functions (e.g. creating MARC records, ONIX records). 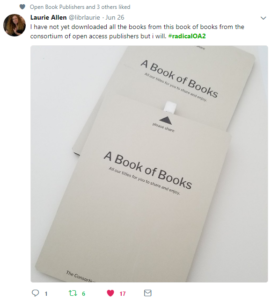 The creation of a shared online catalogue of books. The creation of recommendation engines that each publisher could use to recommend relevant books from other publishers. A basic version of this system has now been completed, with the planned original functionality working well, although the development of the User Interface (UI) that will allow the database to be engaged with more easily by non-expert users, as well as installation instructions, are still being worked on, due to be completed by the end of the summer. The project is being archived on GitHub. This will be publicly shared on a fully Open Access basis as soon as a usable version is ready. The first three goals will be achieved shortly, including the public showcasing of the shared online catalogue. The fourth, the creation of a recommendation engine, is an add-on project for which the group aims to apply for additional funding. 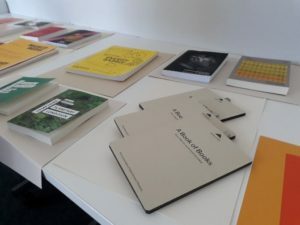 A prototype of the collective conference presence was presented at the workshop, and subsequently trialled at the Radical Open Access II conference the following day. It aims to be a pop-up platform able to be easily transported to and rapidly deployed at relevant conferences attended by conference members. This will allow one press to represent the entire collective at a conference, increasing the reach of all participating presses as well as introducing the collective as a non-competitive association of presses. A booklet introducing each of the Presses and the aims of the consortium. A ‘book of books’ USB device, on which all the books from the consortium were available for rapid transfer to visitors’ computers. 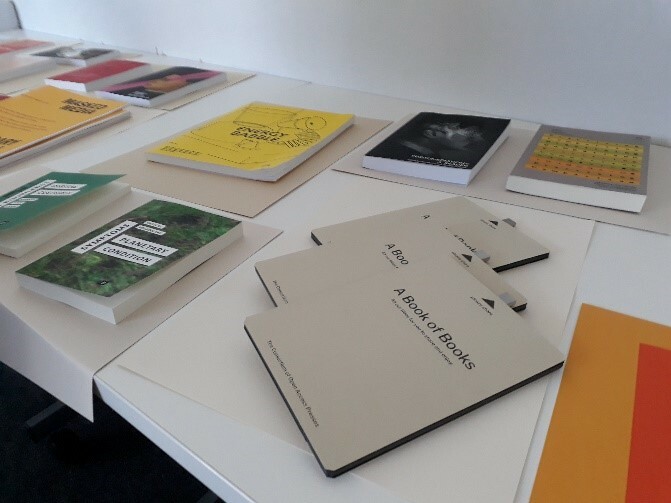 A ‘book of books’ display, in which the front and reverse covers of all books are available to pick up and browse. 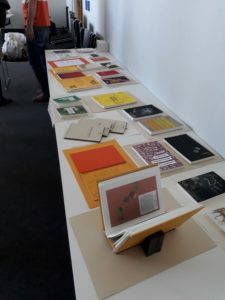 Paper display mats of various colours on which to showcase an assortment of books from each Press. Established greater clarity on the minimum required standards for MARC records. Enabled the sharing of knowledge across the consortium concerning the existing processes that publishers have in place. Taking the decision to formalise the collective of publishers into a consortium. 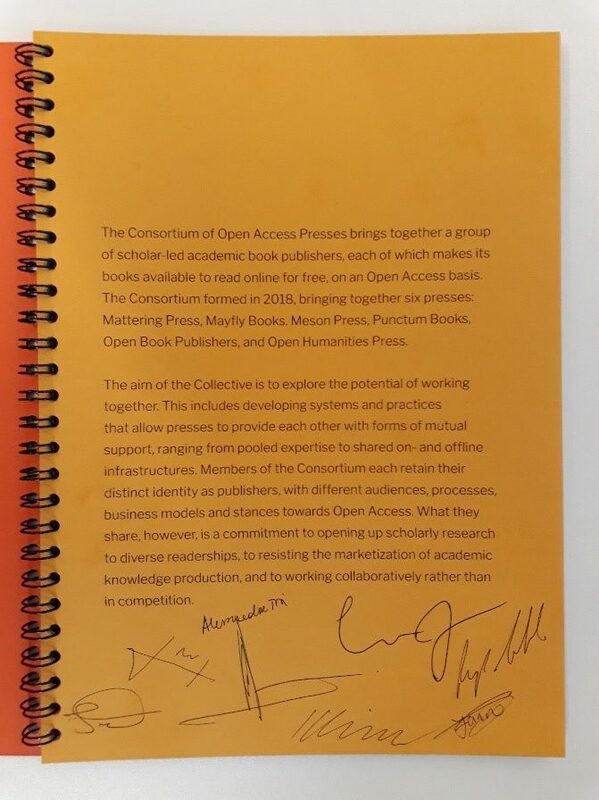 The working title is Consortium of Open Access Presses (COAP). Having this collective identity is considered crucial for developing a collective package to be sold into libraries. Agreeing to integrate into the consortium supportive librarians, who will offer ongoing advice and feedback. A number have already been approached and have expressed excitement about being involved. Their names and affiliations will be announced in due course. 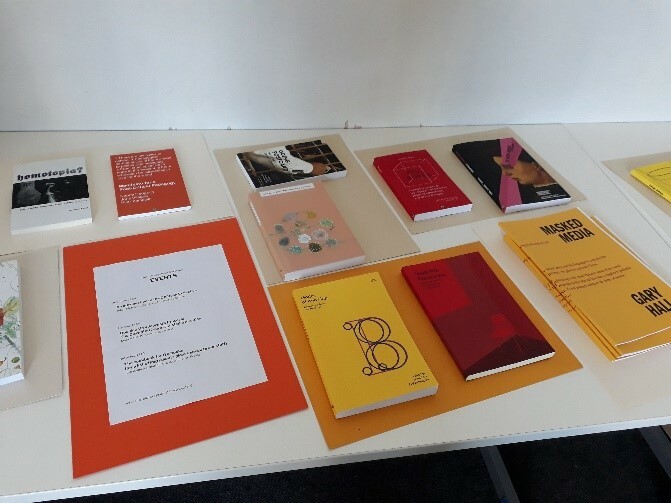 The finished ‘pop up’ conference pack will be showcased at a number of conferences over the summer, including EASST (Lancaster University), the Charleston Library Conference among others. A blog post highlighting the project’s successes will be posted as soon as the final metadata platform is ready for public viewing. 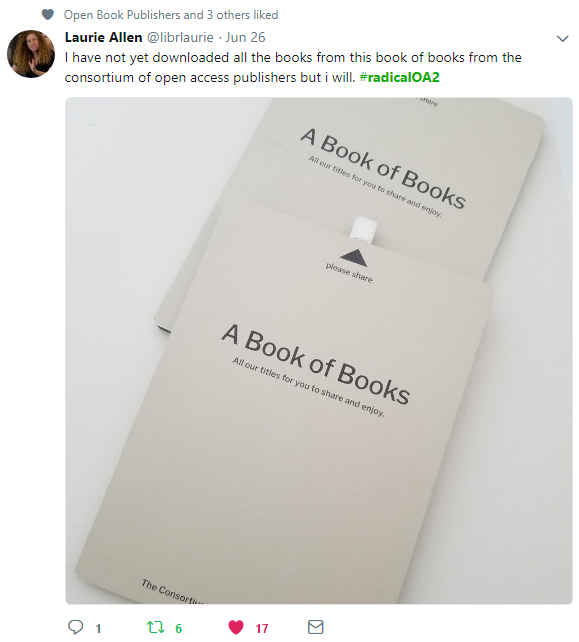 As soon as the final metadata platform is fully completed, it will be disseminated amongst other Open Access book publishers. Presses expressed much excitement and enthusiasm for the collective work of the consortium. We are hopeful that this new collective entity could quite radically change our collective way of working going forward. More concretely, we also discussed developing some new funding bids to further the work of the consortium. If you want to keep up to date please join our mailing list, send us an email, like us on facebook and follow us on twitter. To donate, click here.Mattering Press is a charitable organisation registered in Manchester, UK, Registered Charity Number 1152056. Mattering Press is run by a group of people who care about Open Access academic publishing. Your donations, however little, help us to keep Mattering Press going.